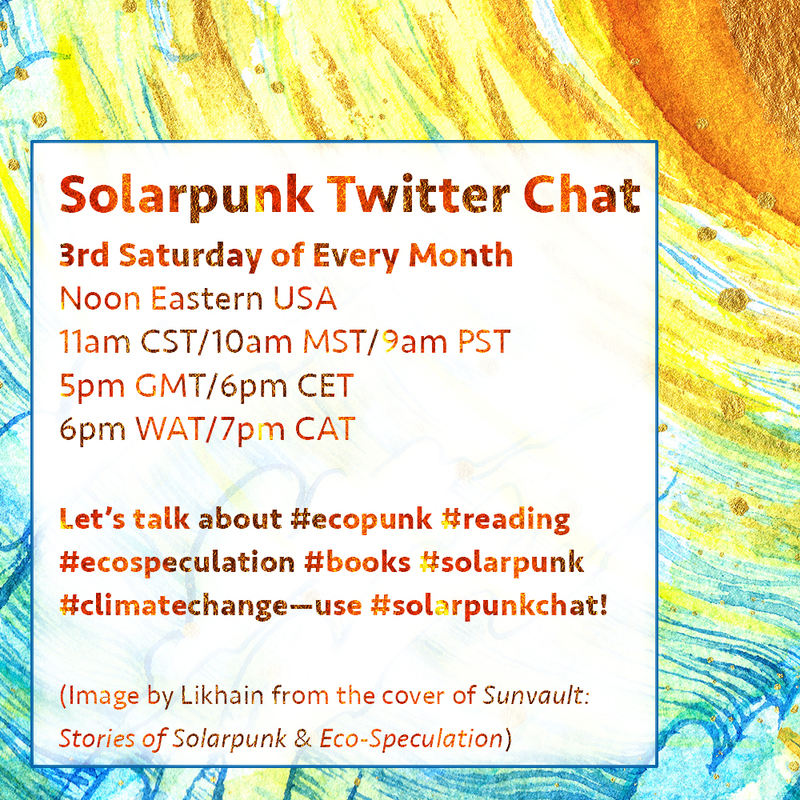 We’ve been having some great conversations at Twitter under the hashtag #SolarpunkChat. I don’t want to attempt to reproduce those conversations here, both because they branch and intertwine and weave and would be very confusing to try to put in order in a single post, and because the participants don’t necessarily want their off-the-cuff ruminations laid out in a more-permanent-feeling medium. Definitely check out the hashtag archives, and join us May 19th for the next one. To everybody who donated to our kickstarter, thank you so very much for your support! I’m very grateful. I’m not sure how to express how much hard work goes into making a book, and having concrete proof that people appreciate my efforts is tremendously heartening. However, after looking carefully at the project, it was pretty clear that we weren’t going to reach our goal, and that I needed to do more to showcase how amazing our writers are and what great books these will be. I’ve been brainstorming with some of my more marketing-savvy friends, and have a ton of new ideas for ways to bring the attention to my writers that they deserve. We’re going to retool a few things and relaunch the kickstarter on June 1st. When I started Upper Rubber Boot in 2011, I thought that it would grow over time until it became a full-time job. I put some money out of every paycheck into the URB bank account to keep it afloat (and I’m still doing that), and I started small. I built up the business to what it is today—a small press that puts out a few good books every year, but, let’s be real, is not appreciably closer to supporting me than it was seven years ago. It has never turned a profit (the closest it came was 2015, the year we published Choose Wisely and How to Live on Other Planets, when we basically broke even). I’ve had all of the challenges of running what it turns out is a non-profit business, without any of the benefits of non-profit status. It’s become clear that turning URB into the kind of going concern that could replace my income as an administrative assistant would involve a level of investment of both time and money that I don’t have available to me, and would also require me to make more profitable decisions in terms of what I publish, instead of focusing on the short fiction and poetry that I love, but which is never going to sell bazillions of copies. I’m lucky to have a fulfilling day job (at a hospital, where I run a clinical fellowship and the lives of four surgeons, and a bunch of other projects including the medical humanitarian work in East Africa and Haiti that I feel so privileged to get to be involved with) where I hope to stay for a long time, so the desire to write and publish full-time that I felt so keenly seven years ago has faded. I’m finding that my priorities in life are shifting. Over a year ago, my best friend and one of the best humans I’ve ever known was diagnosed with cancer. I went back home to Nova Scotia to see her several times, and was able to say goodbye before she died in December. That experience, common as it is, has made me re-evaluate my life in view of what suddenly seems a more realistic mortality. I want to spend my limited time on work that matters. One of the amazing things about micropress publishing is that, because it’s not our main hustle, we can create a space where capitalism is incidental (though not, sadly, entirely escapable) and bring lovely, thoughtful, insightful, and/or challenging writing into the world, without much reference to how well it’ll sell. Doing that is going to be a little easier with not-for-profit status. Thanks for being here with me. I’m so grateful for all of you. Phoebe Wagner and Brontë Christopher Wieland (the co-editors of Sunvault: Stories of Solarpunk and Eco-Speculation) will lead a twitter chat on “Kinship & Collective Action In Solarpunk” on Saturday, April 21st (Earth Day Eve!) at noon Eastern. Click the image to the right to enlarge and get times across the globe! 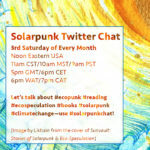 Use the hashtag #SolarpunkChat and follow this month’s hosts @pheebs_w and @BeezyAl, plus moderator @upperrubberboot. And remember, we’re still kickstarting Women Up To No Good! At a time when publishers still release all-male and nearly-all-male anthologies of short fiction, much to our (forgive the pun) horror, we’re providing a counterbalance with short, dark, feminist fiction by some of the best writers out there. Pledge now to pre-order and make these books a reality! 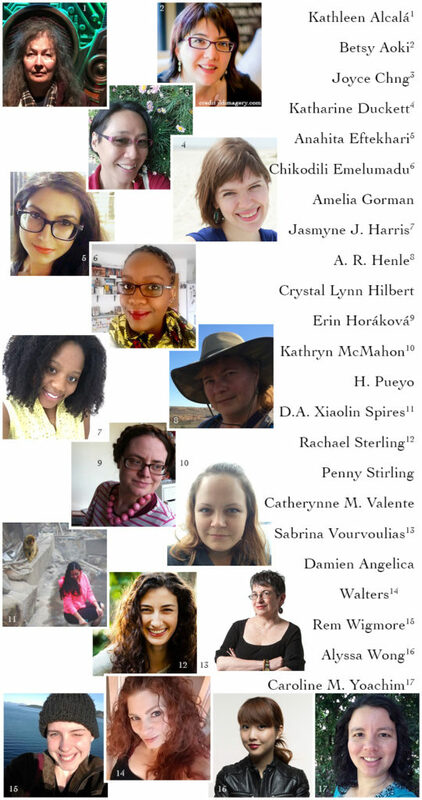 Congratulations to the 2018 Hugo finalists, especially URB authors Sarah Pinsker (Best Novella and Best Novelette finalist and contributor to the anthology How to Live on Other Planets: A Handbook for Aspiring Aliens), Caroline M. Yoachim (Best Short Story finalist and contributor to the anthology Sharp & Sugar Tooth: Women Up To No Good), and Bogi Takács (Best Fan Writer finalist and contributor to the anthologies How to Live on Other Planets and Sunvault: Stories of Solarpunk and Eco-Speculation), and URB artist Likhain (Best Fan Artist finalist and cover artist of Sunvault)!